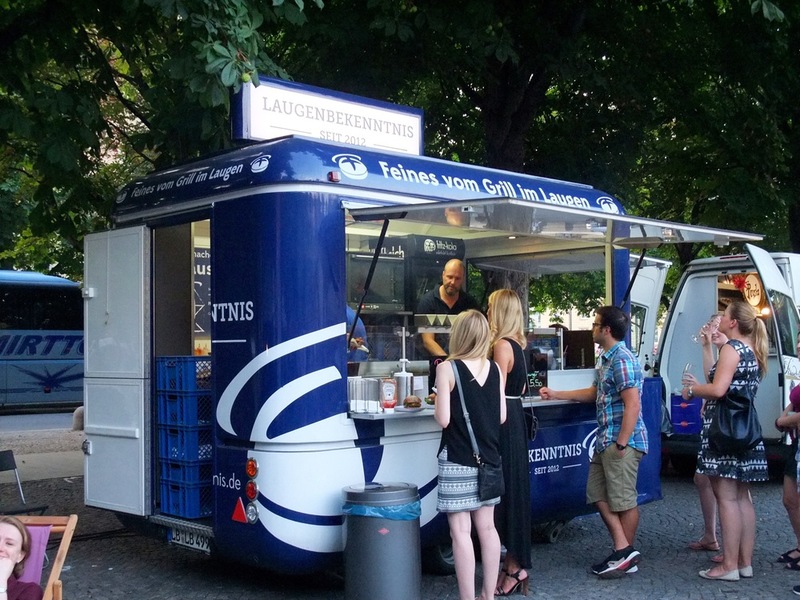 I was really excited to find out last week that someone recognized the high demand for street food in Stuttgart and decided to organize a weekly location for food trucks. The group called Gaumenfreude seems pretty serious about it, too, though it was only through a casual mention by a friend last week that I learned about it. 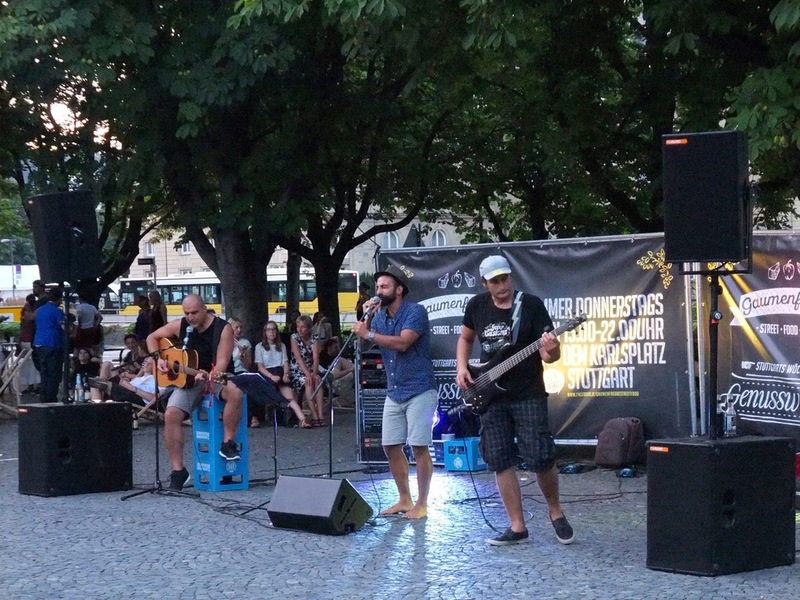 Though it was too late for me to attend their first Thursday at the Karlsplatz downtown, I made sure to mark my calendar for the second and got my chance last night. Because it's been so hot in Stuttgart lately, we didn't make our way down there until about 8 pm. I was immediately relieved to see that there weren't huge crowds or long lines (probably helped by the Sommerfest currently going on). I was also amused to see foosball tables, beach chairs, and a live band set up for the evening. There were over a dozen food trucks set up around the Karlsplatz. Some, like L.A. Taco and Lou's Maultäschle, we recognized from the first street food festival, but there were also several new trucks that I was excited to try. After making a round, I decided to try the hot dogs at L.A. Hot Dog. I went for a Chicago dog with tomatoes, pickles, jalapeños, ketchup, and mustard. It was good, though I have to admit, it didn't blow my socks off. There was a bit too much mustard and ketchup, and their was too much bread for the sandwich. While I chowed down, my husband decided to wait in line at L.A. Taco to finally try their nachos, which we'd been unable to get at the last street food festival due to the long lines. However, first they ran out of meat, and then, after waiting in line for 10 minutes, we were told that it would be another 15 minutes until they could serve even the vegetarian options. Once again, it was not our night for nachos. No matter. Matt headed next to Laugenbekenntnis for a burger in a laugen brötchen...until they, too, ran out of them. He finally settled on a hot dog in a laugen brötchen with homemade honey mustard, fried onions, and relish, similar to the sandwich we'd had from them at the Marienplatzfest. It was definitely more impressive than my hot dog, and I wish I'd have gone for one, too. The roll itself -- salty and soft with a nice sour exterior -- was worth it. Not completely sated by our hot dogs, we decided to try some sides. Matt picked up some sigara borek from the Organic Foods stand, which also had some impressive looking samosas and bulgar salad. I headed over to Mint Monkey to try their "panpotties", a mixture of sweet and regular potatoes with vegetables, green onions, and a vegan remoulade. I really liked the non-meat offering at the street food market, though I have to admit that I found the peppers and celery a bit too crunchy for my tastes. Finally, to round the night off, we decided to try a delicious-looking strudel from Pousche, which apparently comes all the way from Zurich. They had several different flavors, including plum, apricot, apple-cinnamon, wild berry, and strawberry, but I was craving strawberries that night. The strudel was absolutely perfect: soft on the bottom with sweet berries and crispy, flaky pastry on the top. The woman behind the counter even ladled a homemade vanilla sauce over top of it before serving it to me. Yum! We sat and listened to the music for a bit, but we didn't stay long as we both wanted a walk. I still think there's room for improvement at the festival, like the fact that food trucks were running out of food at 8:30 pm (though to be fair, that's more a problem of the trucks and not the provider) and the lack of international cuisine. However, I'm very glad that Gaumenfreude has shown efforts since the first Thursday event via their Facebook event to make improvements, from providing lounge chairs and trash cans to announcing the names of the available food trucks ahead of time. It makes me very excited to see what they'll offer next week, and I look forward to seeing this become a regular event in Stuttgart. 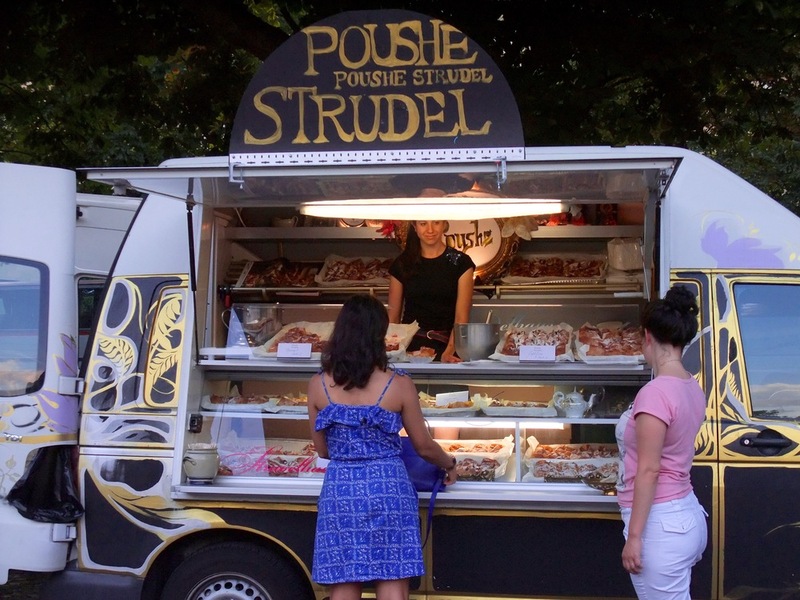 As of the writing of this post, Gaumenfreude has promised to offer the street food market in Stuttgart every Thursday from now until November 10th from 3 pm until 10 pm. 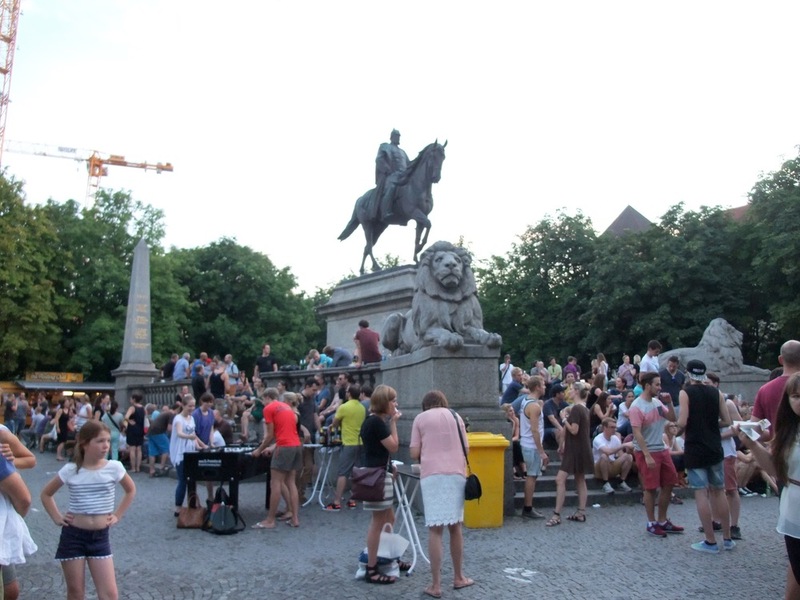 The event is conveniently located in the Karlsplatz next to the old castle and right outside of the Charlottenplatz U-bahn station. Be sure to check out their Facebook page for information on which food trucks will be available on a given week.